The UK 7" release features a brownish black and white band-shot (Morten, Mags and Pål) by Just Loomis on a white background. A light blue a-ha logo is printed on a small black rectangle in the upper right corner. The song title is written in small dark blue letters directly below the logo. The reverse offers a large light blue vertical a-ha-logo on a light grey rectangular background. The logo is partly covered by five small brownish black and white shots featuring the band members. The rest of the cover is white with track listing in small dark blue letters plus a small colour print of the "Stay On These Roads"-album. In addition to the LP-version of "Touchy!" the single also includes the LP-version of "Hurry Home". Limited numbers of the 7" singles come with a free poster (same as poster which comes with 12", see below). 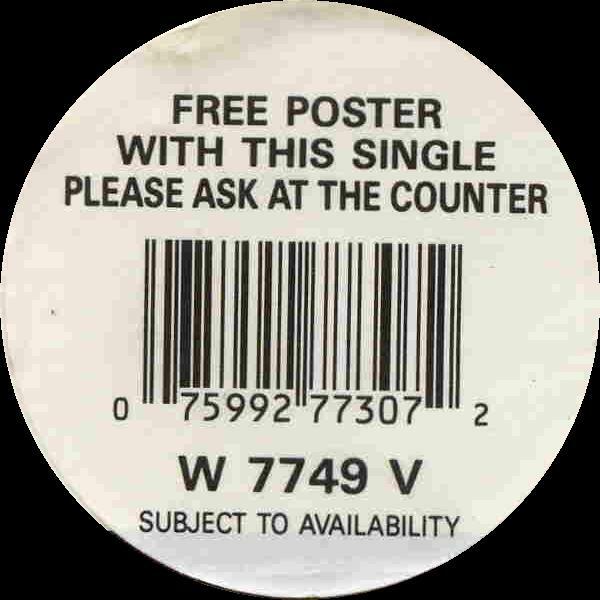 A sticker on the front of the 7" tells about the offer "Free poster with this single please ask at the counter W 7749 V Subject to availability". Some pressings of the limited edition 7" singles have the wrong label stuck on the B-side. 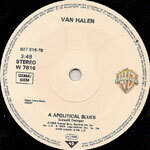 The label of the German made disc claims that the B-side plays Van Halen's "A Apolitical Blues", but in actual fact, it plays the usual "Hurry Home". It is thought that this 7" may have originally been produced for the French market as the disc label has text in French in addition to German and English, although the English limited edition sticker on the front suggests that it was used for the English market. There are two different limited edition 7" tri-fold releases. They are identical except for the a-ha-logo on the front cover. One of the logos is made by green felt while the other is a green blue `liquid' logo. Both of the front covers are otherwise plain white with "Limited Edition" written in black letters in the bottom right corner. The sleeve opens out with two black and white pictures inside, one of Pål and one of Morten. There is a black and white picture of Mags on the back of where the 7" (same as regular, only German) slots in (all photography by Just Loomis). The reverse of the sleeve is plain white with the tracks written in small letters in the centre. The "felt" limited edition of the 7" is rarer than the liquid edition. Supposedly there were a few problems with the liquid-logos with some of them splitting open during transportation. 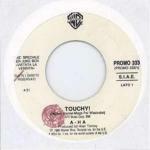 There is also a DJ promotional 7" which features a "DJ Edit" version of "Touchy!" (3:34). This release comes in the same sleeve as the regular 7" with an additional "Special DJ Edit"-sticker on the sleeve and disc label. Some copies also come with a promo sheet with details of the single with the release date hand written on. The front of the 12" is similar to the front of the 7". The reverse is also similar but there are 8 small brownish black and white pictures instead of 5. The 12" has the additional track which is a "Go-Go Mix" (written on the front of the 12" under the title) of "Touchy!" (8:20) mixed by John Hudson with additional production and remix by Paul Simpson. Limited numbers of the 12" come with a free poster. The 22"x22" poster is a colour-shot of a-ha by Just Loomis taken at the same photo session as the one on the cover of "You Are The One" except that Morten is pictured in the middle on this occasion and is looking at the camera. The 3" CD comes in a 5" jewel case with a white plastic adapter. The cover is similar to the front of the 7" single and the reverse of the insert has 3 small brown and white group pictures and large blue "a-ha" logo on a grey background. The German made CD is silver with dark grey titles and WB-logo. An interesting mis-print of the "Touchy!" CD single has the regular a-ha cover, but the disc plays Kim Wilde's "You Came". 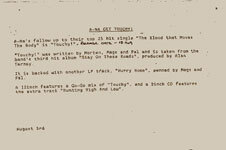 The disc has been printed with the text for both a-ha's "Touchy!" and Kim Wilde's "You Came"! This time the a-ha logo is in block form with silver writing on a dark grey background. The tracks on the CD are album tracks except for the "Go-Go Mix" of "Touchy!". Brazil: There is a promo 12" which comes in a dark red and yellow WEA sleeve with the tracks listed in red. The a-side features the "LP Version" and the "Go Go Mix" of "Touchy!" while the b-side is an "a-ha Medley" (5:24) which is made up of short clips of the songs "Stay On These Roads", "Hunting High And Low", "I've Been Losing You" (listed as "I've Been Loosing You"), "The Blood That Moves The Body", "The Sun Always Shines On T.V. ", "Cry Wolf", "You Are The One" (listed as "You're The One") and "Take On Me". The disc plays at 33 r.p.m. There is another promo 12" of "Touchy!" which has a similar sleeve but with a large sky blue coloured sticker "a-ha ON TOUR IN BRAZIL" stuck on the front. 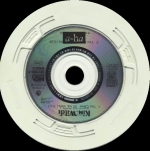 France: The French 7"-release features the same band-shot as the UK edition, but both the a-ha logo and the song title have been enlarged and moved to the centre position. In addition the logo is printed in a much lighter shade of blue. Germany: Some promotional copies of the 7" come with a product fact sheet with information in German. 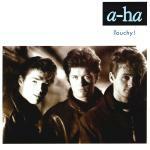 Italy: A promo jukebox 7" is available which has a-ha - Touchy! on the A-side and Kim Wilde - You Came on the B-side. It comes in a plain white sleeve. The disc label is white with black text and WB logo. Japan: The 3" CD comes in a snap-pack with a white sleeved top half as the UK single and a bottom half with two large a-ha-logos; one pale blue on a grey background, the other grey. There are also 3 small brown and white band pictures. The reverse of the sleeve has Japanese writing and the lyrics to "Touchy!" in both languages. There is a tiny black and white picture of the album. The CD is silver coloured with black titles and a red WB-logo. Poland: This promotional DJ 7" from Poland features the tracks "Back Seat Of Your Cadillac" by C.C.Catch and "Touchy!" by a-ha. The disc comes in a yellow and white "Disco Hits" text sleeve. The disc labels are white with black printed and written text. The C.C.Catch side has a green stripe across the label and the a-ha side has a red stripe. The Philippines: The 7" comes in a generic white sleeve. The disc has a jukebox hole in the centre and has a dark beige striped label. Spain: The 7" promotional disc of "Touchy!" has the same track on both sides. It features a black and white band-shot similar to the one used for the "Stay On These Roads"-album. 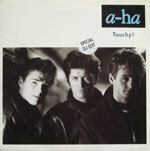 The white a-ha logo is placed in the upper left corner, followed by "Touchy!" in white hand-written style on a grey strip. The reverse of the sleeve is black with white text. The a-ha logo in capital letters is placed just above the centre with the title and production details underneath. In the top left hand corner there is some Spanish text "Ejemplar Gratuito Prohibida Su Venta" saying that it is a promo release. Spain Touchy! (Go-Go Mix) // (LP Version) / Hurry Home? 921 044-0?